Barbeque areas and complete kitchens to cook your meals, or enjoy the many local seafood restaurants. Enjoy the outdoors biking, hiking, kayaking, boating or walking the sandy beach. Choose from three cottages to best fit your romantic getaway or family vacation needs. We offer completely pet-friendly accomodations. Quaint, affordable cottages for vacation rental in Rockport MA often cost less than staying in hotels, and families can enjoy the comforts of living at home while touring this historic seacoast community. Settled in the 1600s, Rockport features lighthouses, beaches, seafood and the classic architecture of New England ship captains' homes. The community draws families, tourists, artists and writers who take inspiration from the quaint lanes, spectacular vistas and photogenic beaches. Rockport Cottages offer you the comforts of living independently during extended vacations and working retreats. You can share the fishing, recreational activities, tours and attractions with all the members of your extended family including pets. The perks of renting cottages allow you to buy meals, cook fresh fish and amazing seafood or enjoy classic New England clam bakes or lobster boils right on the beach. Start your day by watching the sun rise over the Atlantic. Cottages allow pets, teenagers, and young children to pursue their favorite activities and enjoy their personal spaces. Enjoy family time while watching beautiful scenery and listening to the ocean caressing the coast. Scenic Rockport Harbor offers fishing charters, whale watching, stunning landscapes and bird watching activities. Your pet will enjoy the vacation as much as you do, and you can stay longer without feeling the guilt caused by abandoning a loved member of the family. The rocky coast of Massachusetts provides haddock, tuna, cod and striped bass, and fishing charters include excursions to Boston's North Shore, cod and haddock waters on Jeffries Ledge and Stellwag, and scenic trips to the Cape Ann islands. You can enjoy kayaking, sailing, boat rentals, walking, hiking and taking tours of the quaint seaside architecture and attractions. 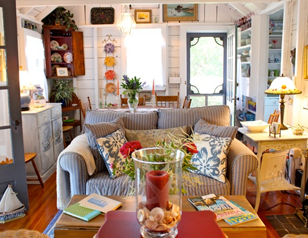 Renting Rockport Cottages allows you enough personal space to design your vacation the way you prefer. Your vacation rental Rockport MA costs less and provides added benefits when you rent a fully furnished cottage home for your stay. You can cook simple meals, entertain, spend quiet evenings on the beach, and give family members space but bring them together for special activities. Savings add up quickly for families, romantic couples or artists and writers who want to concentrate on working in artistic environments. Rockport Cottages offer year-round beauty that includes New England autumns, quaint winter holiday celebrations and impressive summer recreation. Our family has fished Rockport's waters and maintained homes on the coast for nearly 400 years, so we offer some unique historic perspectives and insights. Cape Ann waters offer sailing, whale watching, SCUBA diving, kayaking and deep-sea fishing so that each family member can enjoy his or her favorite activities. Enjoy the historic attractions, scenic coast, museums, churches and lighthouses of Rockport. You can bring your family pets along and even invite guests for a few days. Rockport Cottages offer the comforts of home among the history and beauty of the New England coast.